Hold on.... Why is there an article about a business lady from a town called Rockford, Illinois doing on a website about an obscure period of guitars? Always on the hunt for period literature, I found two separate auctions for a Gibson Retail Price Guide from September, 1969. I hadn't seen this particular piece before, so I tried to decided which one to bid on. One was flawless, more expensive, and probably had never been used. The other had "SAVE - Desk Copy" written on it in big letters. It also had a couple wrinkles and a stamp reading "Koster Guitar Center - 604 Seventh Street - Rockford, Illinois" on it. The auction description mentioned that this item was from a recent estate auction. A little Googling later, and I knew I had to bid on the second one! The HUMAN stories behind LSLP's are vastly more important than the objects themselves. The second copy of the September '69 Price Guide used to sit on the desk of Kay Koster. Kay recently passed away at the age of 95 and was an accomplished local guitarist. Beginning to work in music retail in the 1940's, Ms. Koster's store was one of the first Fender Dealers in the country. Not only that, her store was also one of the first dedicated guitar stores IN THE WORLD. 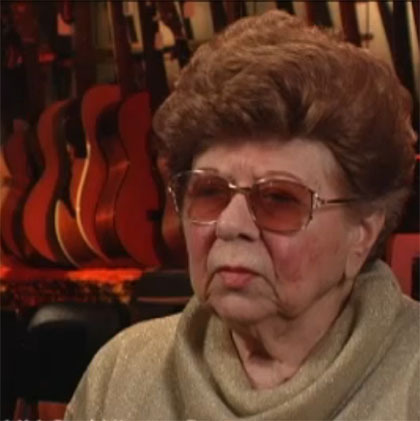 She gave generations of guitarists their first lessons and was a first class repair person. I wonder how many Les Pauls she sold in 1968 and 1969? Or in 1952-1960? You really owe it to yourself to watch her video interview below. Before having her own store back in the 1930's, she would travel five days a week teaching guitar lessons in small towns across Wisconsin. Her first "electric" guitar was stepped on and crushed during a horrible storm during one of these lessons. Someone had ridden a horse to the lesson and ran through the dark to check on the horse when the power went out. CRACK. What a horrible way to lose a guitar! She played golf, was almost thrown in jail, had a band, played poker, and more. She had a radio show too. Her first week of ownership of her store, she had 90 students! "Kay Koster was a pioneering women retail owner, who not only successfully ran a business on her own beginning in 1940. She also personally repaired guitars and amps of all makes and models for decades - even after she closed her retail store. Koster Guitar Center in Rockford, IL was primarily a guitar store, perhaps the first such store in the country. As the Fender line developed, Kay was one of the first dealers in the state and soon became an expert of electric guitar repairs. In addition to her career in the industry, Kay has also been a respected guitarist, first in the big bands and then into rock and roll."